BioCatch is a cybersecurity company that delivers behavioral biometrics, analyzing human device interactions, to protect users and data. 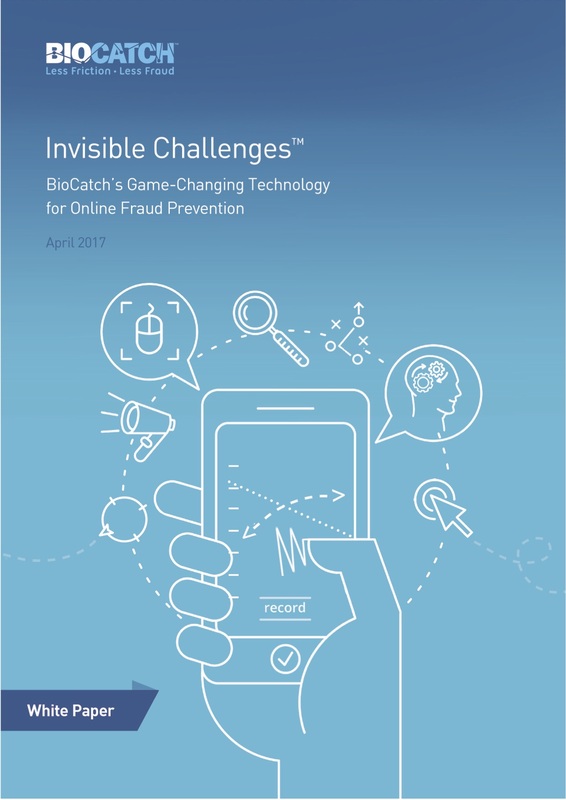 Banks and other enterprises use BioCatch to significantly reduce online fraud and protect against a variety of cyber threats, without compromising the user experience. Invisible Challenges refer to tests that are invoked into an online session without the user’s knowledge, but that elicit subconscious responses that can be used to distinguish a fraudster from a legitimate user. This powerful mechanism represents the latest generation of fraud prevention tools, that addresses the weakness of traditional approaches that rely on malware libraries, two-factor authentication, device ID and other means that the sophisticated fraudsters have learned to circumvent. BioCatch is a cybersecurity company that delivers behavioral biometrics analyzing of human-device interactions to protect users and data. Banks and other enterprises use BioCatch to significantly reduce online fraud and protect against a variety of cyber threats, without compromising the user experience. With an unparalleled patent portfolio and deployments at major banks around the world that cover tens of millions of users to date, BioCatch has established itself as the industry leader.